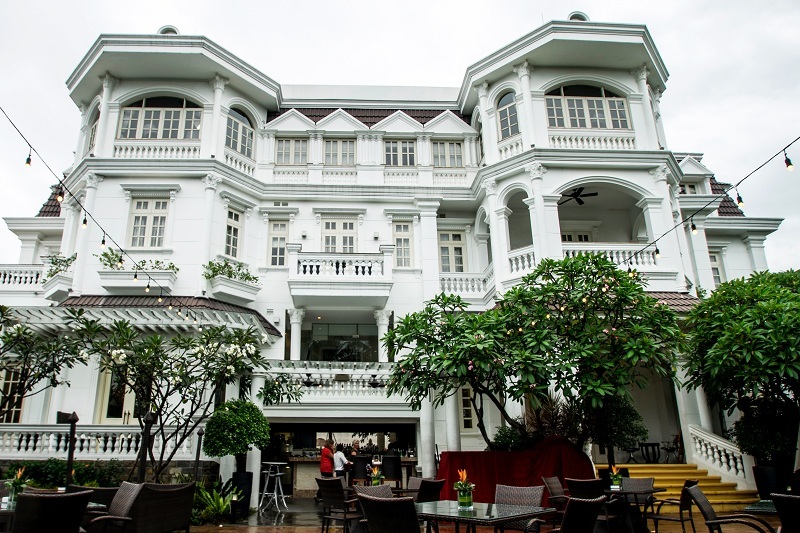 Eating at Bistro Sông Vie (197/2 Nguyen Van Huong, D2), the all-day dining restaurant at the Villa Sông boutique hotel in Thao Dien feels like a sojourn in another world. Walking through the hotel compound we past along a roofed walkway surrounded by luscious vegetation, past the endearingly lit 25m pool and through the hotel’s elegantly appointed reception area. Behind the hotel villa, the courtyard dining area is strung with warm light bulbs, giving it the atmosphere of a french summer fête, the tables dotted far enough apart to give diners a sense of privacy without seeming sparse. Next to the private jetty (river shuttle service available for hotel guests, coming soon for diners), riverside tables offer an obtuse view upstream of the new developments in D2, skyscrapers twinkling in the distance, and on the far bank is the island of Binh Quoi, where wooden dug-out boats shuttle fruit and rice across the river to the city proper. It’s a view that perfectly reflects the menu; modern on one side, traditional on the other. 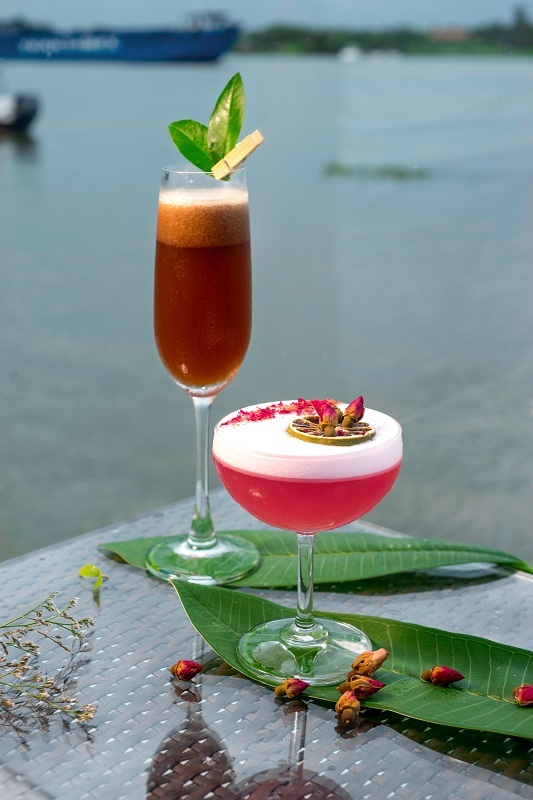 The signature cocktails (VND200,000 each) are works of art; The Pearl of Paradise (gin, pomelo juice, rose syrup, lime juice) looked like a lotus flower floating on a cloud, and tasted as good as it looked. The lime & lychee Saigon Delight was fresh and bright, striking the perfect balance between sweet and tart, which we enjoyed with the complimentary amuse bouche of squid saté. 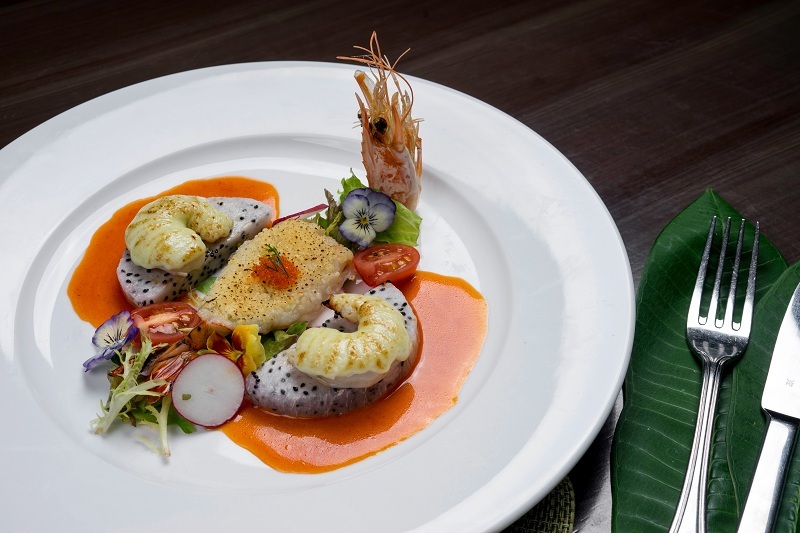 The Western-style prawn starter (VND220,000) is essentially two dishes, the first; two prawns riding atop slices of dragonfruit, whose sweetness perfectly softened the punch of the wasabi mayonnaise. On the same plate more prawns sat in a pool of powerfully flavorsome ginger and garlic sauce, giving us a taste of things to come. 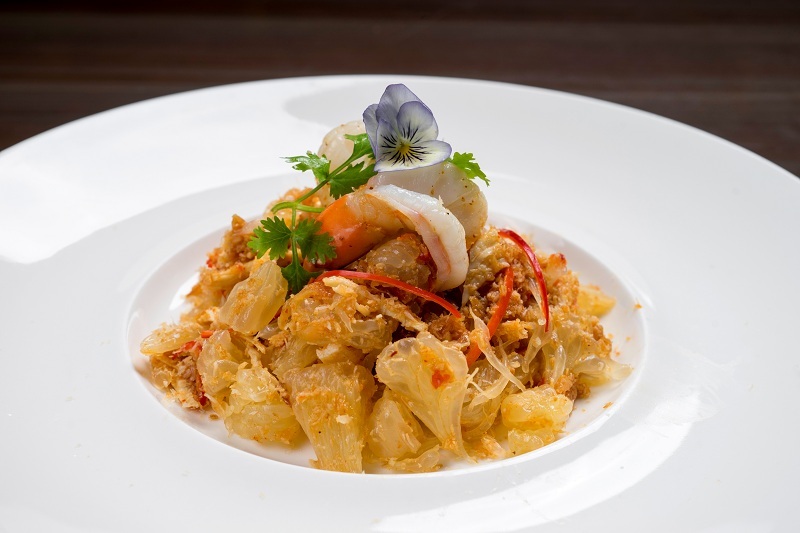 The generous Thai pomelo salad (VND165,000) comprised two huge, firm tiger prawns on a mound of juicy pomelo chunks and shredded chicken, and the combination of textures gave the whole dish a wonderfully complex mouthfeel. The Australian Organic Lamb Rack (VND690,000), pan-roasted and encrusted in Provençale herbs was tender and juicy, served with a thick, sticky red wine sauce. The presentation, laid out like a nautical compass with the four ribs indicating the cardinal points, sauteed Enoki and and potato wedges interspersed between them, was another reminder of the international influences in the food. Our waitress advised us that it would come medium-rare, however mine arrived blue, so if you prefer meat more well done, be sure to ask for medium. If you’re willing to try it as it comes, the dark, pillowy hunks of meat are well worth it. 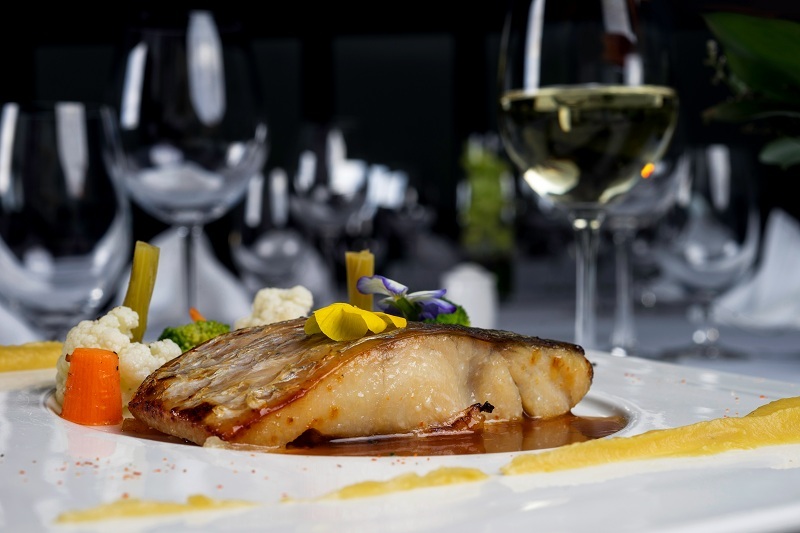 The other main, an Asian-style pan-baked seabass fillet (VND450,000) offers delicate, simple flavors. A marinade containing mirin, yellow miso and white chocolate tagarashi, could have been overwhelming, but the cauliflower cream and onion jus ensured the flavors stayed wonderfully even, and the fish was cooked superbly, flaking into the sauce at a touch. The wines are personally selected and imported by Head Chef Jeremy Choo who makes an annual pilgrimage to France for the September harvest and he offers wine recommendations to complement every dish. Surprisingly, the restaurant only offers one red/ white/sparkling wine by the glass, so there is limited opportunity to sample many of the excellent wines available. That said, the Expression Imperatrice 2014 (France, Sauvignon Blanc) was a delightful complement to the dessert, and the full bodied River Retreat 2015, (Australian, Cabernet Shiraz) would be welcome in any collector’s cellar. Both will be added to the wine list soon. The dessert menu is filled with so many French classics (including a berry filled chocolate soufflé and a puffpastry Normandy apple pie), that my insatiable sweet-tooth was in seventh heaven, eventually choosing the éclair (VND180,000) filled with mango grenache, served with grilled mango and ice cream. The sharpness of the grenache oozing from the éclair and the mellow vanilla flavored ice cream work well together, and the firm slices of grilled mango provide for some really tasty substance. 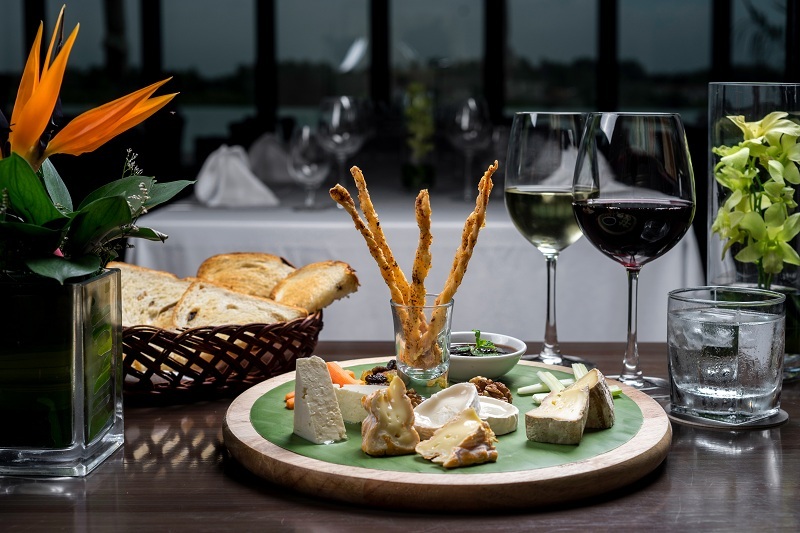 Finding good cheese in Vietnam sometimes feels like a Sisyphean task, one which Bistro Sông Vie have achieved wonderfully. 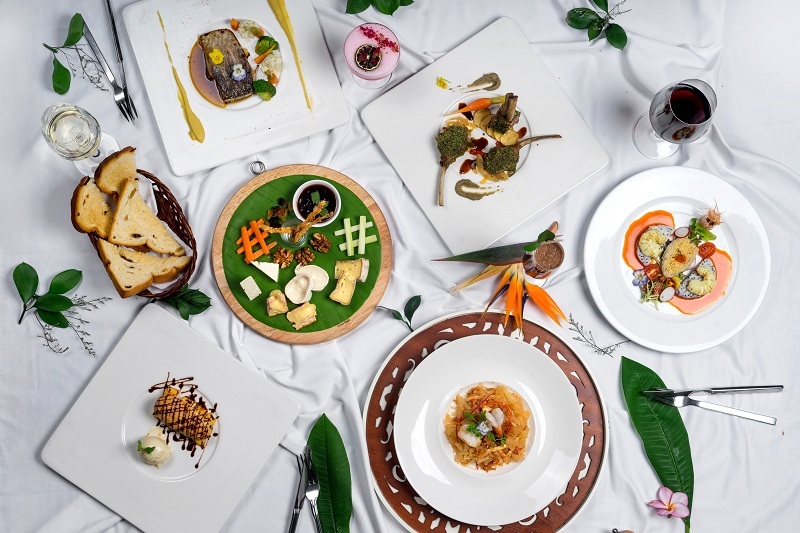 The cheeseboard (VND280,000) delivers two-person portions of five soft cheeses (goat, feta, camembert, brie and reblochon) beautifully presented with twists of peppered breadstick and lightly toasted brioche, marking the perfect conclusion to a well-rounded meal. Considering Head Chef Jeremy only took over the kitchen five months ago and is “keeping the menu simple… for now,” there is enough variety in both the Western and Asian sections to keep you coming back until the menu changes in January. The staff are attentive and friendly, and the whole dining experience is a low-key delight. No wonder so many of the hotel guests decide to eat in-house.